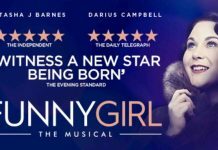 Review: Funny Girl, Regent Theatre Hanley! Following Funny Girl run in London’s West End, the 1964 Broadway musical is currently touring the UK, and you don't want to miss it. Sheridan Smith ‘struggling with BAFTA loss’ pulls out of West End performance! Sheridan Smith pulled out of her West End performance on Monday night, following her BAFTA loss.